Walk on the Great Wall and ride back down on a toboggan; visit pandas up close in their natural environment; Ride Like a Local in a pedicab in Beijing; and enjoy a lesson in Mandarin during your Yangtze River cruise. Arrive in Beijing, China’s political and cultural hub. Transfer to your luxurious hotel. Walk or take a cable car to the top of the Great Wall of China. Hop on a toboggan for an exciting ride back down. Later, view the Beijing National Stadium, also known as the “Bird’s Nest,” and the National Aquatics Center, dubbed the “Water Cube.” Gather for a cocktail and a welcome dinner at your hotel. Enjoy a morning tai chi class at the Temple of Heaven. Ride Like a Local on a pedicab through a hutong filled with winding alleyways. 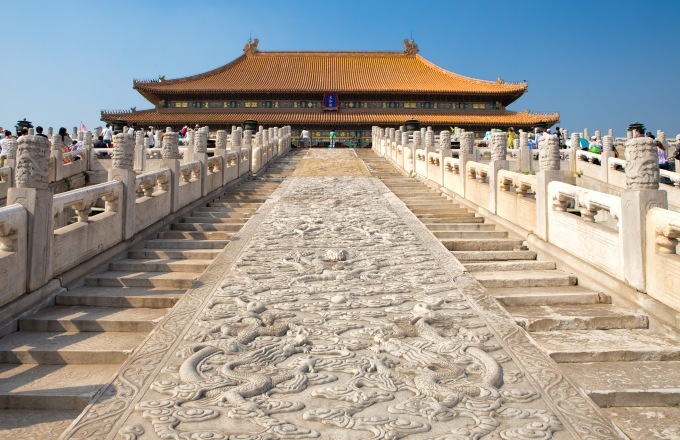 After lunch, walk in the footsteps of emperors in the Forbidden City and wander Tiananmen Square. Tonight, take in a thrilling Kung Fu show. Fly to Xian and enjoy lunch. Then, enter the Ancient Gate of Xian’s City Wall and cycle or stroll along its ramparts. Tonight, delight in a dumpling-making demonstration at a local restaurant. Marvel at the legendary Terra Cotta Warriors, thousands of life-size ceramic soldiers “guarding” the tomb of China’s first emperor. Visit a pottery factory and make your own terra cotta soldier. Fly to Chengdu. Visit the Chengdu Panda Breeding and Research Center to encounter China’s living national emblem playing in its natural habitat. Attend the Sichuan Opera for a mystifying facechanging performance. Enjoy your morning at leisure before hopping on a high-speed train to Chongqing. On arrival, board your river cruiser to begin a three-night voyage on the Yangtze River through the scenic Three Gorges. Spend two adventurous days on the ship and exploring the shore. On board, young guests enjoy lessons in calligraphy and Mandarin, and have fun with crafts and games, in the company of an engaging A&K Young Explorers Guide. Visit the massive Three Gorges Dam Site before lunch on board. Disembark and fly to Shanghai, arriving in the evening. Explore the Bund Sightseeing Tunnel by electric cart and visit the glass Skywalk of the World Financial Center for vistas of Shanghai. Stroll in Old Town and visit the Yu Garden. Tonight, gather for a farewell dinner. After breakfast, transfer to the airport and depart for home. With luxurious staterooms and public areas, expert onboard guides and a peerless staff and crew, ‘Yangzi Explorer’ is ideal for cruising the mighty Yangtze. Yangzi Explorer’s’ spacious and elegant staterooms range from a roomy Deluxe Cabin — at 333 square feet, the largest cabin of its kind on the river — to the palatial Imperial and Celestial suites at 1,183 square feet. Some suites feature a private sun deck/balcony, king-size bed and separate lounge with panoramic views. All cabins and suites include private balconies with al fresco sitting area, private bathroom, minibar, air conditioning and flat-screen TV.